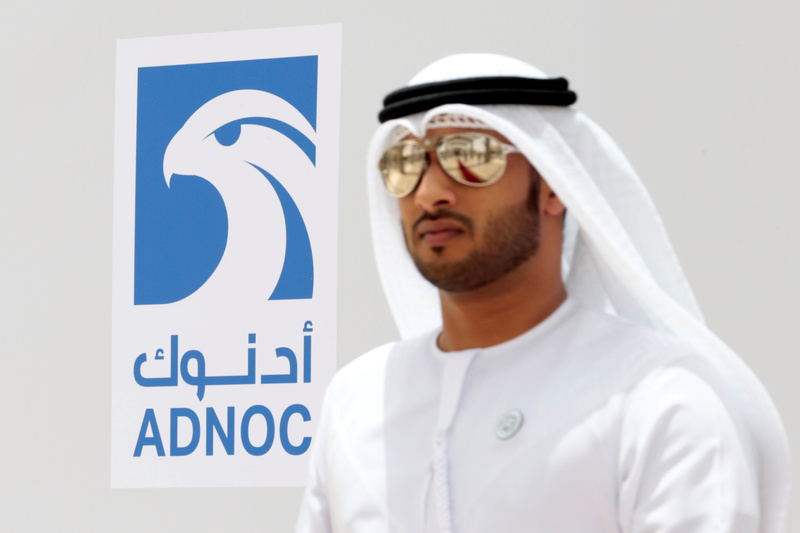 An Emirati man is seen near the logo of ADNOC in Ruwais, United Arab Emirates May 14, 2018. Picture taken May 14, 2018. Italy’s Eni and Austria’s OMV on Jan. 27 signed an agreement to pay a combined $5.8 billion to buy a stake in the refining business of state-owned Abu Dhabi National Oil Company (ADNOC). Eni and OMV will pay around $3.3 billion and $2.5 billion to acquire a 20 percent and a 15 percent share respectively in ADNOC Refining, with ADNOC owning the remaining 65 percent. ADNOC’s refining business has a total refining capacity of 922,000 barrels per day, an enterprise value of $19.3 billion, according to a Reuters report, and it includes the fourth-largest single-site refinery in the world, the Ruwais facility. The trio will also establish and jointly own a new trading operation.